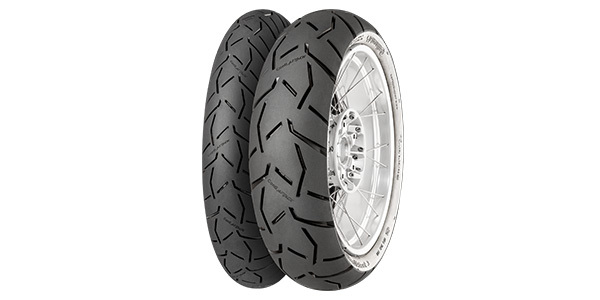 The new and improved Continental ContiTrailAttack 3 debuted at the EICMA show in Milan, Italy. Following the success of the ContiTrailAttack 2, an abundance of impressive innovations makes the ContiTrailAttack 3 a true all-rounder for adventuring and everyday use. It retains its 90 street street – 10 percent off-road pattern design capabilities along with many Continental Core Technologies. It offers remarkable agility, thanks to an extremely short warm-up run of no more than 1500 meters – this is all it requires to reach its optimum operating temperature. In addition, the new Continental Adventurer masters off-road and asphalt routes just as easily as it does varying road conditions, from bone dry to completely saturated. Thanks to the smooth interaction of the three cornerstones caused by Continental’s MutiGrip Core Technology, there is an extra abrasion-resistant center section, a balanced carcass construction and a special profile design. The ContiTrailAttack 3 inspires trust with consistently reliable properties throughout its entire lifetime. Superior agility, precise handling, high comfort and sensitive feedback are the result of all embedded Continental Core Technologies in the new ContiTrailAttack 3.